Scotland's beleaguered Transport Minister Stewart Stevenson has resigned over his handling of the travel chaos caused by the extreme winter weather. Snow and ice brought much of central Scotland's road network to a standstill earlier this week. 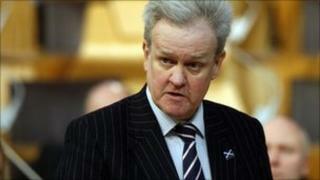 Mr Stevenson had faced days of pressure over the way he handled the problems. The SNP MSP said he "could have done much more to ensure that members of the public were better informed of the situation". In his resignation letter, Mr Stevenson, the MSP for Banff and Buchan, said: "I deeply regret that and for that reason I feel I should step down." First Minister Alex Salmond accepted the resignation with "great regret". In a letter to Mr Stevenson, the first minister added: "I understand your reasons for resigning but frankly I think it is wrong that you should have faced this situation. "You have worked to ensure the preparedness of our transport network for winter weather. These plans have generally proved effective but on Monday we were faced with an unprecedented challenge." A heavy snowfall on Monday - which appeared to take the authorities by surprise - caused the closure of the M8, M9 and A80, as well as gridlock on many other routes across Scotland. Thousands of vehicles were abandoned and hundreds of people were stuck in their cars overnight. The M8, Scotland's busiest road, was closed for two days between Edinburgh and Glasgow. Mr Salmond will announce on Sunday who will take over from Mr Stevenson as transport, infrastructure and climate change secretary. Finance Secretary John Swinney has taken charge until a replacement is announced. Scottish Labour leader Iain Gray said: "Scotland had lost confidence in the transport minister and it was only right that he should resign. "The first minister should not have stretched the issue out over the last week and acted more decisively at an earlier stage." Scottish Conservative leader Annabel Goldie said the SNP government had "bowed to the inevitable". She said: "Conditions in Scotland were appalling. The first minister and his transport minister were being controlled by events. There was weak leadership and an absence of direction. "Stewart Stevenson has taken the right decision to resign, but the first minister and whoever replaces Mr Stevenson have major work to do to regain public confidence." Scottish Liberal Democrat leader Tavish Scott said: "The people of Scotland deserve an awful lot better than they're getting at present from the SNP. "The first minister needs to stand up and take responsibility for the shambles his government is in." In his resignation letter Mr Stevenson, who has been a minister since the SNP were elected in 2007, said he had first offered to quit on Thursday but Mr Salmond had convinced him to rethink. Mr Stevenson added: "I am also conscious there has been a lot of party politics in the last few days and that my continued presence in government would be used politically by our opponents. "I have not devoted my adult life to winning Scottish independence and to working for and serving in this first SNP government to allow that to happen." Mr Salmond replied to the resignation letter by saying: "Even your harshest critic would admit that you have always pursued any task you have addressed with diligence and devotion. "Both these qualities have been evident in your service as a minister in this first SNP government." Mr Salmond went on to criticise the "reprehensible" parliamentary game-playing of some political opponents.